( Total Care, Puppy/Kitten Packages, or Exam & Vaccines), as those services are already discounted. There are many types of roundworms, but some of the most common are intestinal parasites of dogs, cats, and raccoons. Puppies are frequently born with roundworms, and kittens can be infected via the mother's milk or feces. Adult roundworms are ivory colored, four to six inches long, and round (not flat ) in shape. These parasites can cause diarrhea, vomiting, weight loss, and even coughing in these young patients. In the usual case, the owner will not see the adult roundworms passed in the stool. This is why it is important for the veterinarian to do a laboratory test to check for any parasites that might be present. We check for parasite eggs with a microscope. You should bring a fresh stool sample (one that was produced that day) to your puppy or kitten's appointment. It is important to know that animal roundworms can be transmitted to people, and in some cases can cause serious disease. In a recent study from the Center for Disease Control (CDC), it was reported that almost 14 % of all Americans are infected with Toxocara, the most common roundworm of pets. Although most people infected have no symptoms, the parasite is capable of causing blindness (especially in children) and other systemic illness. The infective agent is the microscopic egg in the animal's stool. It is known that these eggs are very resistant to environmental conditions. They have been shown to live in yards, playgrounds, and fields for up to 10 years. The most dangerous roundworm is Baylisascaris, a parasite of raccoons that has an affinity for brain tissue. 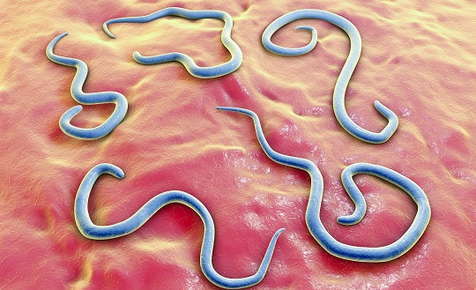 Children infected with this parasite have suffered severe, permanent mental retardation. The majority of raccoons carry this parasite. If wildlife is present on your property, you should patrol the grounds and any raccoon stools should be treated as hazardous waste. Wear disposable gloves to double bag and dispose of the feces. The only thing that will kill the remaining eggs in the soil is fire. The CDC recommends regular deworming of all puppies and kittens to try to reduce the exposure to people. A medication will be dispensed when your puppy or kitten is first seen. Another important measure is monthly parasite preventative, or what we sometimes call "heartworm preventative." Many of these drugs are also effective for roundworms, and are an important part of a wellness program.